Potential Unlocked provides customised training to its clients. We can provide workshops on a range of topics, from auditing techniques, process mapping through to writing organisational procedures and audit reports. Appropriate skills training is essential to the successful delivery of a quality management system and meeting organisation objectives. The program can be specifically designed for in-house clients and attendees will receive a Certificate of Attendance. 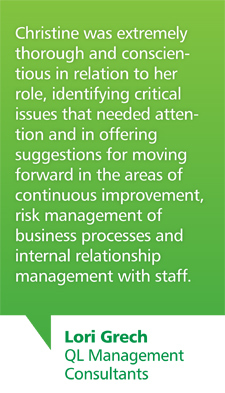 Organisations requiring their staff to gain RABQSA-AU and RABQSA-TL, Potential Unlocked aligns itself with two RTO organisation's for this purpose. Determine documentation required for each process. 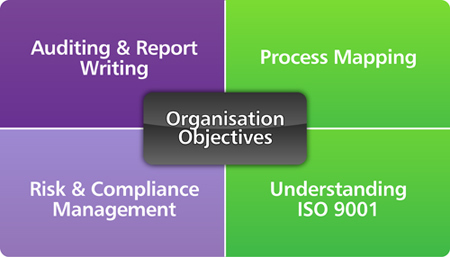 Identify, interpret and apply ISO 9001 requirements to their organisation. 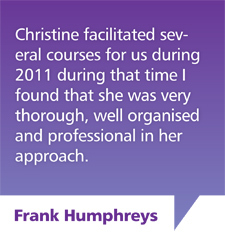 "Christine facilitated several courses for us during 2011 during that time I found that she was very thorough, well organised and professional in her approach. Christine was able to motivate the group through various exercises and group discussions, and was able to provide recent and relevant case study information to help us obtain a better understanding of the course material. She has an excellent delivery style and very confident in her approach keeping the group interested and the session flowing. At the conclusion of our course all participants had a much clearer understanding of the subject matter and we found the course to be very beneficial." 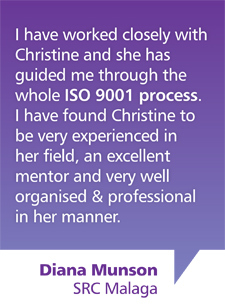 "Christine really made the course, she is an excellent facilitator and very passionate about Auditing, so this made the course really enjoyable and interesting. I can't wait to get involved in setting up the audit program at our company and working in this area."